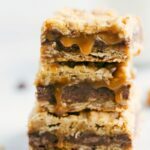 The BEST EVER Carmelitas -- oatmeal bars with a thick layer of milk chocolate and creamy caramel. Preheat the oven to 350 degrees F. Line a 9 x 9-inch baking pan with parchment paper and set aside. In a large bowl, mix the softened/partially melted butter, brown sugar, flour, oats, baking soda, vanilla extract, and salt. Divide the mixture in half and press 1 half of it into the prepared 9 x 9-inch pan. Bake at 350 degrees for 8 minutes, then remove. Sprinkle the chocolate chips evenly over the crust. Pour the melted and slightly cooled caramel over the chocolate chips. Crumble the rest of the oatmeal mixture over caramel and then bake for another 13-18 minutes until the top layer is lightly browned. Remove from the oven and allow to cool at room temperature for at least 1 hour before cutting into the bars. Best enjoyed within 2-4 days (store in an airtight container).